PUBLISHER: Ramapo Publishing Co., Inc. NOTE: Illustrated by Gene Zukor. This is essentially a book of random dice rolls interspersed with cartoons. 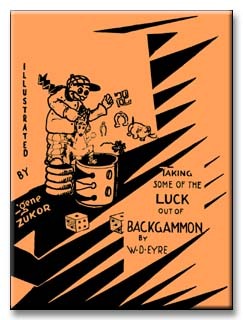 COVER: This Backgammon book is a combination of modern-day wit and humor with a means of improving one's game. Mr. Zukor, who cartooned the book, will be remembered as the author of that delightful volume of cartoons "Isn't It So." In this new book he has surpassed himself. The cartoons are subtle, sophisticated, whimsical and appealing with the individual quirks and hidden meanings that typify the humor of young Zukor. It is a store-house of wholesome wit. This book will appeal to all classes of people and its appreciativeness will not be confined to those only interested in Backgammon. There are 60 pages of dice throws in this book, printed exactly as they were thrown during regularly-played games of Backgammon.